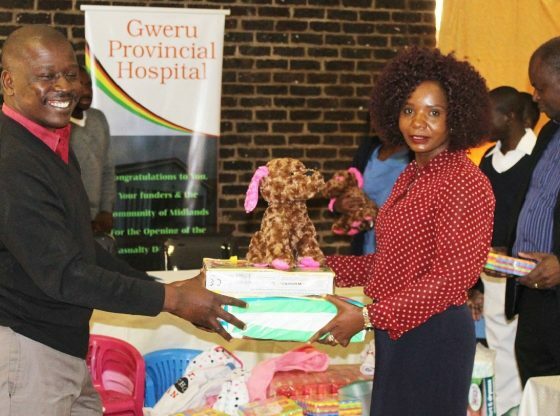 The Midlands State University`s Marketing Management Department has donated an assortment of goods to the Gweru Provincial Hospital`s Paediatric Unit as part of its corporate social responsibility initiative. The goods which included food, bed sheets, clothing and children`s toys were handed over at a ceremony attended by lecturers and students from the Marketing Management Department as well as the hospital authorities at Gweru Provincial Hospital on Thursday, the 28th of June 2018. MSU Chairperson in the Marketing Management Department, Mrs Miriam Mugwati said as an institution, the University does not only impart academic knowledge and skills to the graduates but also strives to produce good and complete citizens who are able to connect with communities. She expressed hope that the donation will help alleviate the difficulties that mothers go through during the times when their children are admitted in hospital. “The responsibility to capacitate public hospitals cannot be left to government alone. It is everyone`s responsibility both corporate and individuals to assist in improving healthcare facilities because these are the institutions that provide affordable healthcare to all residents. Gweru is a city of progress. Our donation today is to ensure that as the city progresses; our provincial health facility also progresses”, said Mrs. Mugwati. A representative of the Marketing Management students, Victor Shumba said through the programme the institution has instilled in its students the culture of giving and expressed optimism that the donation will change the lives of children who are admitted at the hospital. “Let us realize now that those of us who have been privileged to receive education, skills and experience must be role models of the future generations. We can now be role models in our lives by showing great care for others, as the provincial Gweru hospital donation will go a long way in improving the Paediatric Ward that will consequently have an impact on our mothers and babies,” he said. Acting Gweru Provincial Hospital Medical Superintendent Dr. Tendai Chandaengerwa expressed gratitude to the institution for kind gesture saying, the goods will enhance service delivery not only for the benefit of children from Gweru but the rest of the Midlands Province since the hospital is a provincial referral health centre. “This is a rapidly growing place and that also means that the numbers of people that have to come and get service is ballooning and yet the resources are constrained. Thank you for thinking of us. Thank you for thinking of the little children and on behalf of the children that are not going to be able to come to you and express their gratitude, I would like to say thank you,” said Dr. Chandaengerwa. The donation worth $2 000 is among the numerous Corporate Social Responsibility Programmes that are undertaken by the institution.